Annette McCleave has the cover for the second book in her Soul Gatherers series. 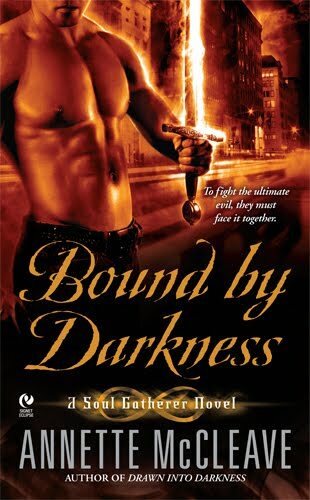 Bound by Darkness releases May 4, 2010. In my review of Drawn Into Darkness, I called it "a strong debut bringing together both solid characterization and a winning story line. 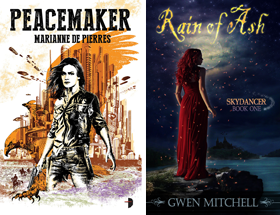 Urban fantasy romance fans will likely want to add the Soul Gatherers series to their stable of guaranteed enjoyable reads." You can read my review here. An eye-catching cover that nicely complements the first book. Soul Gatherer Brian Webster has long lived with the guilt of his failure to save his teenage sister. When another girl dies in his arms as she protects an ancient coin from a demon, he takes up her cause. The coin is one of thirty pieces of silver paid to Judas. United, the coins are a dark relic of immense power, and in the wrong hands, they could destroy civilization. Lena Sharpe is on her own mission to find the Judas coins. A Soul Gatherer by day and a thief by night, she’s negotiated the most important deal of her life. When Brian intervenes and kidnaps her to obtain the coins, she attempts to escape. But the brazen warrior is unrelenting, as he is fearful that the beautiful felon has made a pact with the devil himself. And he’s not entirely wrong. Bound together by burning desire and a similar darkness in their hearts, they race against time to recover the missing coins. But as the truth behind Lena’s bargain surfaces, Brian is faced with a desperate choice—save one or save many.